With guidance from the National Head Start Association and Too Small to Fail, developmentally appropriate activities including literacy prompts were incorporated throughout the playstructures. Landscape Structures Inc., a Delano, Minn.-based commercial playground equipment manufacturer, has expanded the Smart Play® line of playstructures with designs especially for 2- to 5-year-olds. Introduced in 2017, Loft offers plenty of interactive elements to engage developing minds and bodies. And now, the Loft family has grown to include the Fire Station and Market Cafe to further encourage social and imaginative play for kids ages 2 to 5. With the Fire Station, kids can take control at the wheel, pat Sparky the friendly fire dog or slide on down to their next adventure. There’s plenty more to keep them busy including an object find game, plenty of bells and gears, and a fun mirror that shows them how they’d look in uniform. The Market Cafe lets little ones take turns placing meal orders, dining with friends and talking about yummy food choices. Among lots of activities, kids can make pictures in the image panel, bing-bong the apple bell and chat about food colors and tastes. Best of all, playground designers can double the fun by connecting any two playstructures—Loft, Fire Station or Market Cafe—with an elevated crawl tunnel to enhance the imaginative fun and physical activity levels. Or connect all three to create the Centre for kids to explore and stay active. 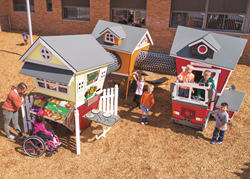 Even more, with guidance from the National Head Start Association and Too Small to Fail, developmentally appropriate activities including literacy prompts were incorporated throughout the playstructure designs to engage children and adults in language-rich conversations. The Fire Station and Market Cafe join Loft, Nook, Venti, Cube and Motion to make up the Smart Play line of playstructures. These compact playground designs are a great choice for schools or childcare centers that have limited outdoor space. Even more, each Smart Play playstructure makes the most efficient use of materials to create a large number of activities. And the compact size of these structures requires less space and surfacing materials than typical playgrounds, resulting in a lower total investment. See Centre in action and learn about all of the interactive play events found throughout this smart playstructure design at playlsi.com.